How did they lift those 15 tons stones? How could they place those stones so neatly ? Certainly the civilization of Inca reached to a great stage without the help of modern day technology. Think about the buildings at Machu Picchu or at Cusco. They are beautiful to look at. Some of the stones with which they are made of weighs more than 15 tons. But if you watch carefully you will be surprised with the placement of those stones. They were placed neatly side by side. That is why when you will reach Peru, guides will certainly mention about the gap between those stones. Those stones are so carefully placed that you can not slide a knife between them. How they sized them nobody knows. We all still be surprised by the beauty of structures made by Inca's all around Peru. Not only the structures, what about their highways! They were made with high standards. The roads were the base behind their becoming a powerful nation. In the city of Cusco, as well as in other well-known Inca town, the walls of temples and places are not perpendicular but slope slightly inward. they are so-called Egyptian style, being narrower at the top than at the bottom. Some of their temples and palaces were built of carefully selected ashlars of white granite. the lower tiers of a wall are made of larger blocks than the upper. This gives it a look of massive security. If one visits outlying places one find story-and-a half houses with gable ends. Usually on the outside of each gable end may be seen a row of roughly cylindrical blocks or stone peges bonded into the wall and projecting a foot or so from its surface. These stone pegs suggest the idea of being the petrified ends of wooden beams and purlins. The Incas did not use tiles or shingles to cover their roofs, but had to depend on thatch made of grass as bushes. The thatch was tied to the purlins and was kept from blowing away by being tied to the ends of the projecting roof pegs. While the purlins themselves were fastened to the gables by being tied to the eye bonders. There were usually eight or ten bonds There were usually eight or ten of these eye-bonders in every gable. These little stones were about two feet long, six inches wide and two inches thick and were buried in the sloping edge of the gable with a chamfered hole or eye about two inches from the outer end. It was set into the gable wall at the right angles to its slope in such a way as to flush with the surface, a little space being left on each side so the eye could easily be reached when it was desired to lash the purlins to steep pitch of the gable. Inca houses were frequently arranged around a courtyard so as to form a compound as in the far east, which usually had only one entrance. entrances to compounds were furnished with the means of fastening a bar across the inside of the door. Stone cylinders or pegs during their construction as bar holds. The use of bar-locks, eye-bonders and roof pegs by the Incas is an evidence of inventive genius which testifies to long occupancy in the high lands. There were no furniture in the houses of Incas. The place of furniture was taken by a series of niches arranged symmetrically in the walls. These niches were usually about three feet in height, ten inches in depth and two feet in width. Narrower at the top than at the bottom and placed in the wall so as to be nearer the floor than the ceiling. these niches came eventually to be recognized as a great household convenience. Inca architects were careful about drainage. Small channels were constructed under their storehouse and under the walls of courtyards wherever pools were likely to collect. How those people placed those gigantic block of stones at mountain top is still not fully clear to the present scientists. "How were such titanic blocks of stone brought to the top of the mountain from the quarries many miles away? How were they cut and fitted? How were they raised and put in place? Now one knows, no one can even guess. There are archaeologists, scientists, who would have us believe that the dense, hard andesite rock was cut, surfaced and faced by means of stone or bronze tools. Such an explanation is so utterly preposterous that it is not even worthy of serious consideration. No one ever has found anywhere any stone tool or implement that would cut or chip the andesite, and no bronze ever made will make any impression upon it." "It appears that the Inca technique of fitting the blocks together was based largely on trial and error. It is a laborious method, particularly if one considers the size of some of the huge stones at Sacsahuaman or Ollantaytambo. What should be kept in mind, however, is that time and labour power were probably of little concern to the Incas, who did not have a European notion of time and had plenty of tribute labour from conquered peoples at their disposal." What we know today from scientists is that they used a straight stick with a hanging plum-bob to trace the edges of the bottom stone and mark off exact points for carving on the top stone. Then they sculpt the top one into shape using hand sized and finger sized stones. This is a practical way to do it. But did they follow this method or not is still unknown to us. Moreover how they carried and lifted those stone is still a mystery. Whenever Incan won a war they tried to learn the arts of the conquered society. One thing they always did was they incorporate the ideas and arts of the other societies in a Incan standardized form, so that the culture or arts could be replicated easily. 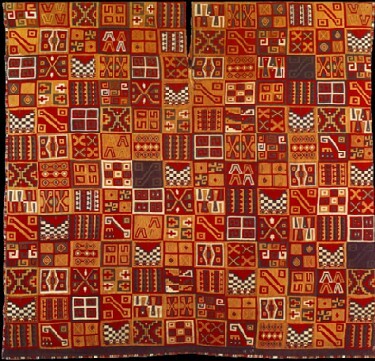 During Inca period	clothing was an important aspect in their society. Incas wore clothes according to their position in the society. The Nobles wore far better quality than the general Indians. But the basic of the clothes were almost same. Inca men wore simple tunics. The length of the tunic were a bit long. It reached up to their knee. The women wore skirt. Skirts were usually full length, which covered up to ankle. Men wore a cloak over the tunic. Both men and women used cap. On their cap they tied a folded piece of cloth. In the highland and coastal area they materials used for clothes were different. Usually wools were used in highland and cooler fabrics were used in coastal area. Incan used gold and silver to make potteries. That is why lot of people searched for gold in last centuries. Certainly they also used copper, bronze and tumbago. They always used images with different colors in their potteries. They liked bright colors like Red, Yellow and Orange. They always decorated their potteries with shapes like diamonds, squares, checkers, triangles and circles. They also liked to decorated them with pictures of animals and insects like that of Jaguars, alpacas, llamas, bird and butterflies.